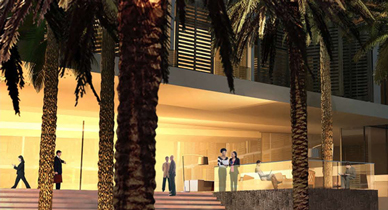 Description: Design and construction services for a luxury hotel located in the heart of Palm Desert, California. This site design features two wings – one hotel and the other residential use. Each wing has an internally framed courtyard. The wings are segmented by a signature arrival court with 40’ high interwoven concrete entry pylons to accentuate the arrival. The hotel wing features a sky garden with a cantilevered pool, ultra cabanas, and a restaurant. The hotel courtyard features a grand stair spilling down from the entry with pod terraced seating interspersed throughout. At the heart of the courtyard is a reflecting pool with a ‘runway’ juxtaposed within it for modeling shows.